I can’t believe I’m saying this, but I have a beef with Michelle Obama. It’s unsettling because Michelle Obama is the Mary Poppins of real people to me. Practically perfect in every way. Intelligent, witty, courageous, empathetic, and dang… those arms! It was a honor to have her represent our country as First Lady of the United States, for about a million reasons. So as soon as I could preorder her book Becoming, it was done. Take my money, all in. 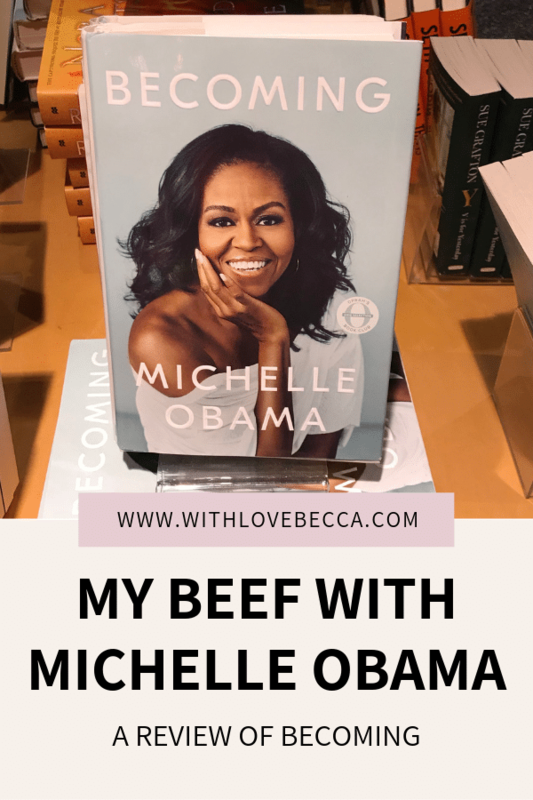 What follows here is my humble review of Michelle Obama’s book – the love, the fascination, and that pesky little beef. First things first. I love Becoming. LOVE it. Like Michelle Obama herself, it’s also practically perfect in every way. 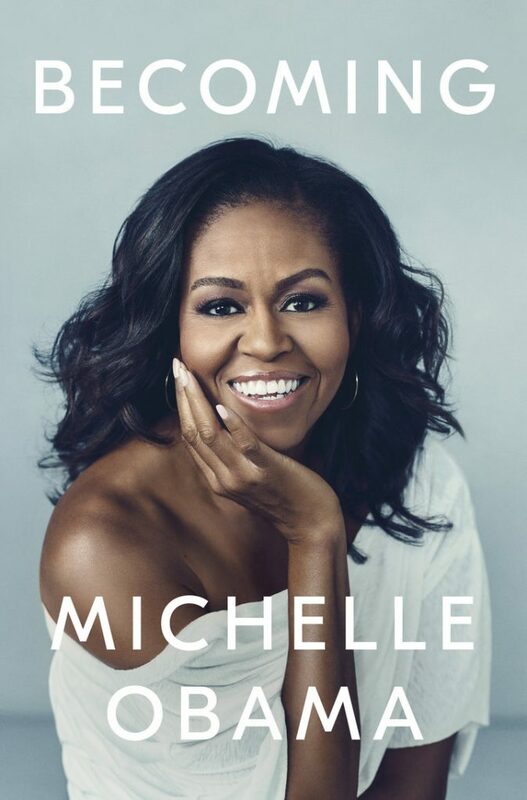 I went with the Audible version so I could take it on the road during my commute, and so that I could hear Michelle’s message in her own voice. It made me feel like we were besties going for a stroll. Which is also why I call her Michelle here. She told me it was fine. I was entranced by the history of Michelle’s life. The challenges, the joys, the deep reflection on both simple and monumental moments. At times her language is almost poetic, and at times it’s like you’re texting with your mom. 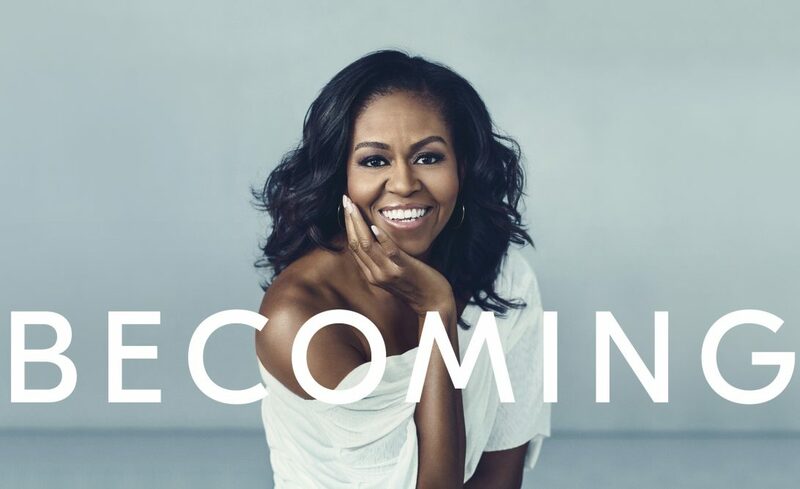 Both styles meld so perfectly together to create a story of how Michelle Robinson became Michelle Robinson, and then Michelle Obama, and always Michelle. There is one chapter of Becoming in particular that focuses on one of Michelle’s best friends, Suzanne. Suzanne was a woman full of joy, and a woman always in search of MORE joy. That was how she measured her life. If she wasn’t doing something that contributed to her happiness, she was out. Now this wasn’t in a selfish way, but rather a very purposeful “I want to live my life to the fullest” way. During the course of their friendship, Michelle and Suzanne butted heads over the merits of joy and pragmatism, and they were both correct in their own way. I relate to Michelle’s collegiate desire to achieve and please, but I find I relate more now to Suzanne’s pursuit of happiness. Life is too short to miss out on the scary thing that could also bring immense pleasure to your life. As you read Becoming, you’ll find that Michelle comes to this realization too and it makes her career path, and how she interacts with the world, make that much more sense. We’re getting close to the beef of this book review. But not yet. We’re still on the cheesy appetizer of my love for Michelle. In a way I’ll consider it a dose of self love because I found that with the exception of being First Lady of the United States and lifting weights, Michelle Obama and I share some rather specific similarities. For one, we have the exact same piano recital story. It’s nearly identical. In Becoming she tells it with some beautiful ties to life outside the piano hall and creates a stirring metaphor about perfection and lack there of. I, on the other hand, tell it through the eyes of horrified parents and money washed down the drain. But other than that, same story. Further, I was deeply moved by her experience with miscarriage and infertility. This is a part of my life I have chosen not to keep hidden because when I was in the depths of our pain, other family’s stories became my lifeline. I desperately needed to know that we weren’t alone. The Obama’s bravery in telling their story brought me to tears, as do every story of pregnancy loss or infertility. This line hit particularly hard – “Fertility is not something you conquer. Rather maddeningly there is no straight line between effort and reward.” I thank Michelle for using her platform to share this message of truth and solidarity. I wish I could say I shared Michelle’s passion for fitness, but exercise and I have a more low key friendship with fewer burpees and more brisk walks. But Michelle and I do share an Alma mater, close brother/sister relationships, a bond as mothers of two, career paths that brought us to work in higher education, short stints in attempting the part-time work gig, AND extra long inseams. I feel deep a connection to her, I’m PRETTY sure she feels it too. Now I completely get where she is coming from with this, I’ve been writing a lot on this topic myself. It’s more about what do you want to be when you grow up NEXT. Not a final destination. And as part of that “what,” you are also deciding “who.” But I have to argue that I do find distinct value in the “what do you want to be when you grow up?” question for kids. This particular question offers an opportunity for adults to encourage children to imagine what their future could look like. It offers a chance to go exploring in the mind, think about your interests, and dream without restriction. I ask my kids this question all the time, encouraging them to think of ALL the things they could be or want to be. I asked it as a camp counselor too. Kids need support and genuine interest from adults to build their futures. That seems to be the furthest thing from useless to me, both as a parent and a career coach. Michelle Obama has spent much of her career encouraging young people to see new possibilities for their futures and chase their dreams. She has touched millions of lives with her optimism, leadership and candor. Perhaps that’s why I reacted so strongly to the notion that “what do you want to be when you grow up?” is a useless question. Because I don’t know if she really means it. And next time Michelle and I hang out, I think I could pretty easily convince her of my point of view. Hey Michelle, text me. Overall my beef with Michelle Obama’s book Becoming came down to a single word, “useless,” in a book of 100,000 words. So even as a lover of words, I’ll try not to get too hung up on one. At the end of the day I not only think this book is special, powerful, and exceptionally written, I also think it is important. It’s an important view into the the world of a woman who grew up “having nothing, or everything, depending on how you look at it.” It’s an important reminder of the humanity of our nation’s leaders and the rich histories they bring to the roles, our country’s racial divides, and the pressures on working moms. And it’s an important testimony to the value of holding strong to your principles, owning your story, and embracing the journey of becoming. Becoming is a gift to be treasured. Thank you, Michelle Obama, for putting Becoming into the world. I, for one, am better for it. Thank you so much for your kind words, Vanessa! That’s amazing you lived so close by. What a cool fun fact! Again, thank you for reading and I hope you enjoy the rest of the book.